Brasserie Neumünster is filling up with jazz lovers. Some read the paper and have a coffee or an early beer while they wait. Before long, people are standing in the back and by the door, or sitting down wherever they can fit. They’re a mixed crowd. The youngest listener is lying on a table waving his arms and feet, utterly unaware of why he’s there. His parents are there to listen to Edith Van Den Heuvel and the Ben Heit Quartet perform a tribute to Joni Mitchell. Edith is a Dutch jazz singer living in Luxembourg since 1994, back when there was no motorway around town and everybody thought Luxembourg was way too small for anything Auchan-sized. The year after, Luxembourg was cultural capital of Europe and Edith recalls the city getting a major makeover, including the Abbaye de Neumünster where she’s about to start the show singing Both Sides Now. Edith has seen both sides of the Luxembourg jazz scene, the practically inexistent one in 1994 and the thriving one today. The lack of jazz in the Grand Duchy when she first arrived was frustrating, but she joined the English-speaking musical theatre group Pirates and the choir Voices International. For jazz, she had to cross the border to Trier, where she found jazz clubs and workshops, and where it was easy to get contacts. Today she thinks the Luxembourg jazz scene is big enough, with JAIL (Jazz in Luxembourg) and their Apéro Jazz and Piano Plus programs, l’Inouï in Redange-sur-Attert which she describes as one of the most wonderful clubs in the region, and a new generation of good musicians such as Pascal Schumacher and Ernie Hammes. Edith is staying in Luxembourg yet missing Holland a bit, it’s about the freedom that comes with feeling at ease because you know the language and the culture. On the other hand, if she were to go back, she’d miss the international aspect and meeting all kinds of people in Luxembourg, including jazz people. Edith enters the stage in black and in all simplicity. A long necklace on a leather like tunic, and that’s all she needs. Her voice will do the rest. Before long, it feels dark outside – the jazz club feeling permeates the room on a Sunday at 11.30 am. With her natural, modest and unpretentious look, Edith creates a complete focus on her voice, and on the piano, the saxophone, the double bass and the drums, each of the five instruments shining in their own right. Her voice is deep and full, with a soft power. She makes singing seem easy and effortless – the proof of hard work. Edith started singing in a children’s choir at age 9, and she’s been singing and dancing at school and on stage ever since, with choirs, in musicals and in jazz bands. Her eyes talk about the fun she’s had. Her first musical influence was her big brother, who had all these great records she used to listen to: Zappa, Electric Light Orchestra, Gino Vanelli. At age 15, she fell in love with jazz in general and with Ella Fitzgerald in particular. A year later, she fell in love with the boy who is her husband today. They made silly bets and if he lost, she was allowed to buy a CD. That’s how she got her first Ella CD, a double one at that. Today it’s still Ella, but also the pianist Bill Evans, Bobby McFerrin who constantly experiments with his voice and composers like Michel Legrand who has his own distinct signature. When she was studying in Utrecht, she sang in what she calls the most enthusiastic vocal group in Holland, award winning Dekoor Close Harmony, and she took jazz singing lessons. “Those are the best memories from my student days.” Once again her eyes talk about all the fun. After moving to Luxembourg, she hooked up with Trier-based singing coach Heinrich Thiel, who said that if she wanted to learn more, she had to get her own band. So he helped her get a quartet together. A big step, up there on stage with her name fronting a band. After the baby years, Edith has a son of 11 and a daughter of 9, she wanted to make jazz things happen again. So she went to the Liquid to find a new quartet. Then she realised she needed to do a demo and she made one, another big step. Then she hooked up with German jazz guitarist Dany Schwickerath and with the Blue Art Orchestra from Cologne. In 2009 she did a CD with Schwickerath called “Hidden Waltz”, a compilation of jazz standards performed in their own intimate way. 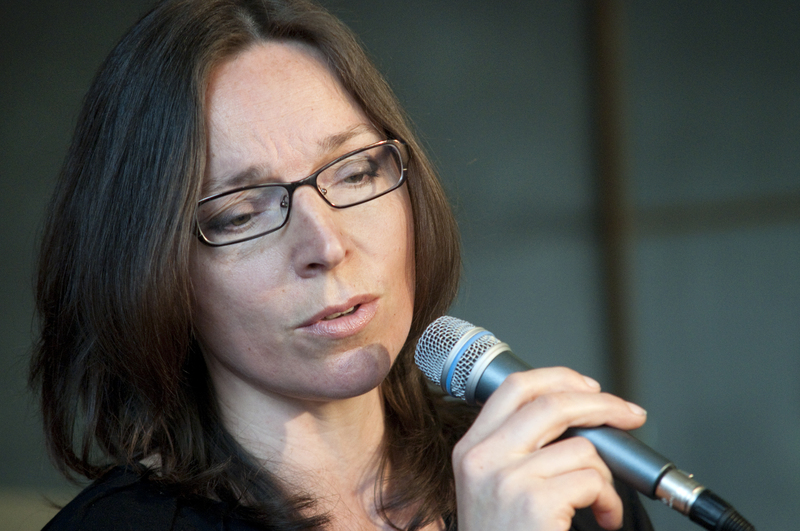 In 2010 she performed at two well-known jazz clubs in Berlin, and in 2011 she featured on a CD with the Blue Art Orchestra. Major steps. They are completely into their music, the five musicians on the Brasserie Neumünster stage this Sunday, maneuvering with seemingly ease and obvious joy the difficult jazz leaps yet always staying in touch with the audience. Edith’s left hand, the one not holding the microphone, is expressively leading the music. Her slight movements are reflected in the audience, there’s the characteristical jazz nodding of heads. Blue Motel Room. I Had a King from Joni Mitchell’s 1968 debut album. A mother is tapping her fingers on her grown-up daughter’s back to the quick rhythms of The Dry Cleaner from Des Moines. The nodding heads and tapping fingers might not think she needs it, but Edith would like to take more lessons, maybe classical for the voice training. Her approach is to take the best part from each teacher and mix it with her own intuition so she doesn’t get too stuck on one thing. This year Edith will be singing concerts in Germany and at a tiny jazz festival in France, and she’s looking to organize more gigs. She also plans to work more with London based jazz pianist Frank Harrison, maybe even record something with him. Let go, get into the flow and don’t think too much. Thinking cuts the energy! Stay positive, go and perform, be nice to the technician! The concert is over with Centerpiece as an encore. The centerpiece of the concert leaves ample space for the excellent musicians of the Ben Heit Quartet. She sends her big smile and deep laughter to the technician and to the audience to tell them she’s enjoyed it. People take the music with them as they leave… Black Crow Flying in a Blue Sky…and squint at the grey sky over the Neumünster Abbey and at the daylight. They had expected it to be dark. To whom much is given, much is expected! Talented woman sharing her magic with the world. All the best Edith!